"This time out, Kastning (30-string contra-alto guitar, 36-string double contra guitar, and piano) approaches the improvised sounding compositional work as a trio, along with Sándor Szabó (electric guitar and baritone electric guitar) and Balász Major (drums, percussion), both of the latter from Vác, Hungary. The recordings were done both at Traumwald studios in Massachusetts and at Tandem Studios in Vác, although the specifics of what was done where are not clear. Anyway, it doesn’t matter – with a load of effects and two studios in play, much can be achieved in a dreamy and sparse musical environment that these three musicians masterfully create. Ethereal I (from earlier in 2018) featured only Kastning and Szabó; here Major contributes his spacy percussion and drums, which, evolving out of a similar root idea as its predecessor, adds an entire new dimension to the sound, although Major isn’t keeping any kind of steady beat, he is in full improvisational mode as well, which still gives Szabó and Kastning their freedom and purely creative space. All three musicians have created together many times before, mostly Kastning and one of the others, but the last time all three worked together in the same space was on the 2013 album Becoming, but don’t use that as a strict reference, as the two are quite different; each piece in this puzzle is unique, taking its own path through an unconventional melodic maze. “Hollow Sky” is subtle on the percussion, but both guitarists are taking advantage of that space, with Kastning paining a rainbow of colors in the background, while Szabó plays kaleidoscopic melodies affected by stunning flashes of reverb and subtle echoes out front. “Portals I” and “Portals II” account for a full album side of twisty turny melodic meandering with just enough percussion (mostly hand drums) to keep it all fluid and interesting for the duration. Throughout all the album’s nine tracks, much attention is given to space, so you never get a condition where too much sonic density ruins a beautiful view into the soul of the three musicians as they create. Of course not, these three have recorded together numerous times prior and know exactly what they are doing." "Although this flow-on album to Ethereal I could be considered as something of an improv collection of works created by Kevin Kastning, Sandor Szabo and Balázs Major playing in a highly eclectic jam session it is far more; it is a very measured, finely designed and composed work, which as with much of Kastning's composing does not fit easily into any one category. The album has a certain delicacy of sound which has been beautifully sculptured in the first piece Arrival (Second Recall) a 10:23 sec soundscape, which delicately pushes the boundaries of percussive sound defined by guitar, underpinned with percussion, making this a perfect vehicle for reflective meditation. This may seem a little too far out there as the work could be considered as seriously pure jazz, but it vibration works well on the transcendental level. The hollow void of space without shape or form has been captured to perfection, seconds before the deep bass notes of the piano strike with precision changing the elements to the unbeknown and unforeseen depths of Ethereality II. When followed by Supernal Vapor, a more definitive percussive piece, featuring the 36- string contra guitar designed and perfected by Kastning, the work broadens in perspective encouraging the mind to relax and enjoy the rare, timeless beauty of classic sound waves. For those who understand the value and intrigue of portals as a component of life’s multilayered spirituality, Portals I and Portals II listened to either individually or as a collective sound journey, make the perfect accompaniment to serious transcendental meditation as the pieces are once again measured, inviting and intriguing. In the final composition a drum roll, followed by gentle tapping sets the stage for Third Departure, an intriguing title to say the least, and an intriguing piece to complement the title, highlighting the meshing of musicians at the pinnacle of their discipline: Kastning on contra-guitar, Sandor Szabo on guitar and Balázs Major on percussion. As a freewheeling, improv style of music from this combination of talent the work is sharp, precise, and stunning in its simplicity and yet the complex nature of construction develops as a rich, multitextured soundscape to be enjoyed to the fullest." "For their 2018 album, Kevin Kastning and Sándor Szabó enlist the sounds of percussionist Balász Major and the net result is Ethereal II. The second in a series of albums featuring Kastning and Szabó that began earlier in 2018 with the release of Ethereal I, this second Ethereal album is just as dazzling sounding, if not better, than the first. The addition of Balász on drums and percussion completes the sonic structure and also echoes the Kastning / Major CD release of Kismaros from mid 2018. The prolific nature of Kevin Kastning, as both a guitarist and composer notwithstanding, serves to underscore the brilliant fretboard moves in play on Ethereal II. Recorded both in Kastning’s Boston-area Traumworld studios and in Sándor Szabó’s studio in Hungary, Ethereal II merges Kastning’s unique 36-string Double Contraguitar, his 30-string Contra-Alto guitar as well as his acoustic piano with Sándor’s processed electric guitars. The crafty guitar work and musical insight of these groundbreaking artists reaches new levels of sonic intrigue, while the drums and percussion of Balász completes the wide-ranging musical imagination depicted on Ethereal II. Guitar purists may question the ultra spontaneity and avant-garde nature of Kastning and Szabó’s music, yet there’s no denying the expertise with which these two unique musicians execute their performances on Ethereal II as well as on various other projects and recordings they’ve recorded and released on Kastning’s Greydisc label—a fine American label following in the footsteps of other avant-garde outlets such as the Germany based ECM label. Like ECM, Greydisc offers the listener a range of boldly executed, and sonically rewarding releases that combine high levels of improvised music with a definite flair for the unusual. 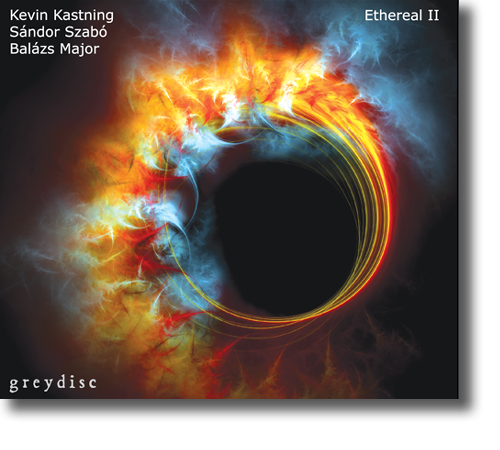 One of the finest Greydisc CD releases to date, Ethereal II sets yet another high standard of musical dialogue from the skillful trio of Kastning, Szabó and Major." "Ethereal II is really absolutely great!! I enjoy it immensely and it is in my car CD player ever since I received it. I must have listened through it 4 or 5 times by now. I enjoyed your previous albums with Sandor and Balazs a lot as well and I was delighted to see that this one is a trio with both of them. It is a joy to listen to this music, the 3 of you compliment each other so very nicely. I love it, thanks for doing such great music my friend!" In which we find the guitar genre busting Kastning moving beyond his usual solo and duo dates and into the realm of being his own Manfred Eicher by expanding to a trio of past cohorts rounded up together and creating an environment for them to work and play well with each other. Going well beyond the pale and spacing out even farther than if they just kept it to opium den music, the trio creates other worldly sounds that are as cohesive as they are disparate. Wild stuff that just might have you never looking at the 30 string guitar the same way again. Solid left leaning stuff that draws the middle to it." Kastning seems to gravitate to the duet format, but this is a recurring trio. Kastning's 36-string Double Contraguitar, 30-string Contra-Alto guitar and piano are joined by Szabó's electric guitar and electric baritone guitar and Major's drums and percussion. It is an especially rich timbral mix. Kasning's acoustic guitar provides chiming double-coursed sounds reminiscent of a 12-string guitar, as well as occasional bass parts. The electric guitar provides electronic washes for accompaniment, as well as a contrasting lead voice. And the drumming is an equal partner, sometimes atmospheric, sometimes keeping time. Opener "Arrival (Second Recall)" contains all of this; "Etheriality I," which follows it, sticks to a mostly slow moving soundscape. Major includes Indian tabla drums in his arsenal: they are especially prominent on "Supernal Vapor" and "Portals I." This is a splendid improvisational session, full of variety in tempo and texture: an excellent starting place for listeners new to Kastning's music. "This is the first time that I chronicle an album of Kevin KASTNING, I confess not knowing his music well. I happened to see his name as an associate musician on other albums, like Mark WINGFIELD or Michael MANRING to name a few. Who is Kevin KASTNING? First he is a guitarist / composer, he plays several types of guitars: 36-string double counter-guitar, 30-string contra-viola guitar, 17-string extended-hybrid classical guitar, extended 15-string classical guitar, twelve-string guitar, guitar six-string guitar, fretless guitar, 12-string extended baritone guitar, 6-string bass-baritone guitar, alto guitar, 14-string counter-guitar, 16-string counter-guitar, 17-string counter-guitar, 12-string soprano guitar, mandolin, piano and bass. In addition he is an inventor: without going into all the details, it should be known that he has created several rather unique guitar models with the help of different partners. I invite you to visit his site which is very informative (http://www.kevinkastning.com/ ). Kevin KASTNING's style is not easy to approach. As an influence we can name the modern classic, jazz and avant-garde acoustic music. So far Kevin's discography is quite impressive, many are solo albums, some like this one has collaborators, in this case it is Sándor SZABO on guitars and Balazs MAJOR on percussion. "Ethereal II" presents nine tracks, all instrumental that total more than one hour of music. If there is an Ethereal II, you say that there was an "I" number and you're right, "Ethereal I" was released in January 2018. The music now, the compositions are, as I saying it was difficult to tame, "Ethereal II" offers a delicate sound that has been beautifully crafted, we realize it quickly by listening to "Arrival (Second Recall)" with its 10:23. It gently pushes the limits of percussive sounds defined by the guitar, supported by timid percussion, making this track a near perfect vehicle for meditation. For many listeners this work could be considered pure jazz, but I also see some minimalist influences. As I said, the listener will have to show a great open-mindedness, the world where KASTNING and his acolytes sail is not accessible to all. Each of the 36 string master's productions is an adventure in itself, and on "Ethereal II" the addition of the drums reinforces the unique sound structures. supported by light drumming, making this track an almost perfect vehicle for meditation. For many listeners this work could be considered pure jazz, but I also see some minimalist influences. As I said, the listener will have to show a great open-mindedness, the world where KASTNING and his acolytes sail is not accessible to all." 8.3/10.